Many library trips with R have gone like this: I slowly walk around, scouring the many shelves, looking for beautiful books with wonderful themes about the outdoors, growing food, etc. I hold three books in my hand when I meet up with R. Meanwhile, R runs up to one shelf, literally grabs 15 books of equal parts Barbie and the modern, fluorescent rendition of Strawberry Shortcake. She drops the stack down near the checkout, demanding to take them all home. A dreaded feeling comes over me. Do I love that R enjoys books? Of course! Do I want to fill our peaceful afternoons reading in the garden with Barbie and her pals? No… Now, I’m not interested in discussing the merits and perils of parent censorship of children books. I simply want to increase awareness of some of the children’s books that our family has discovered that align better with our lifestyle as we garden, raise animals, create beauty, and spend time in the magic of the outdoors. Every Thursday, I will take a closer look at a children’s book along the themes of gardening, nature, farming, the outdoors, and such other topics that keep the magic of this more simple life alive in us all. It can be difficult to sift through the hundreds of children’s book titles out there, so I am really excited to share with you some books that our family has discovered along our reading journey! I realize not all of you have children, but perhaps you have a niece, a grandson, a little neighbor, or a special friend. I hope you will find these books as wonderful as my family has. Today I kick my feature off with a book that our family has been thoroughly enjoying for years, and have not yet come close to exhausting! For the family that gardens with young children, or aspires to have a garden, this book is a must-have on many different levels. I can’t say enough positive things about this book. Age: All ages! Your youngest listeners will love the vivid pictures, recognizing the vegetables they are seeing in your home garden, while your older readers will love following Lily’s example and might be inspired to try Lily’s roasted pumpkin seed recipe. Text load: Every other page has half a page of text. Lots of beautiful pictures! 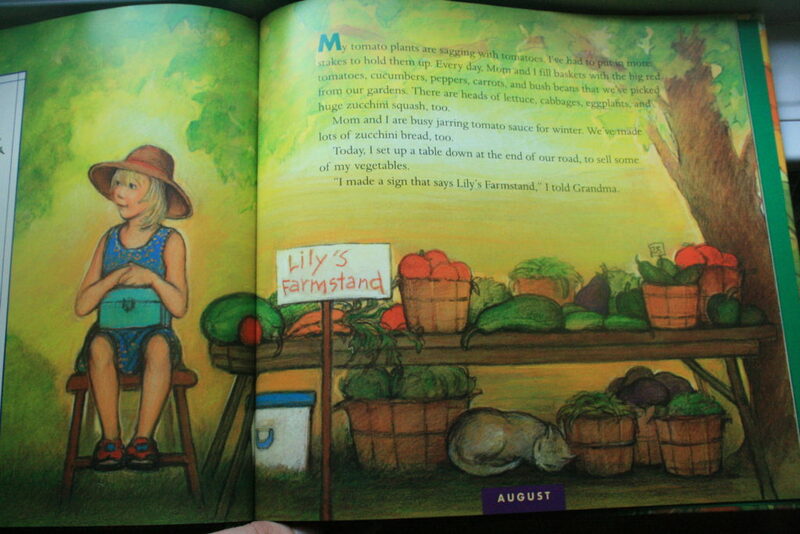 This book follows a young girl named Lily through the entire year as she maintains her very own garden. She will walk your young reader through the work she puts in all season, the bountiful harvests, and even setting up her own farm stand at the end of their road. The book walks the reader through the entire year. What is Lily doing in Feburary? in July? in November? It really helps our young readers to contextualize the activities they might join you in throughout the year in your garden. Plus, we learn how peas like cold weather, while tomatoes do not! Lily is close to her grandparents who just moved to California, while Lily lives in Maine. This contrast in climate is highlighted in the book so that the reader learns how different crops grow well at different times, in different places. I am so smitten with these gorgeous pictures. Page after page, it really demonstrates the beauty of this lifestyle of producing one’s own food and being in tune with what is grown locally. As I mention above, I love that this book grows with the child. The youngest readers will enjoy the pictures and story, and work on recognizing some of Lily’s vegetables, while the older children will dig deeper into the book, and perhaps replicate some of Lily’s activities and recipes. 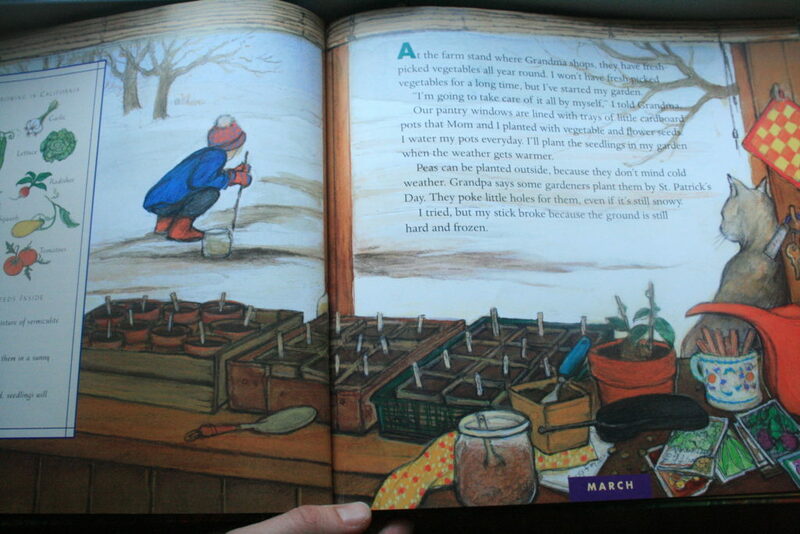 This is also definitely a book to try if you have a reluctant young gardener in the house. Last but not least, each page has an incredibly informative sidebar that could be a book in its own right. 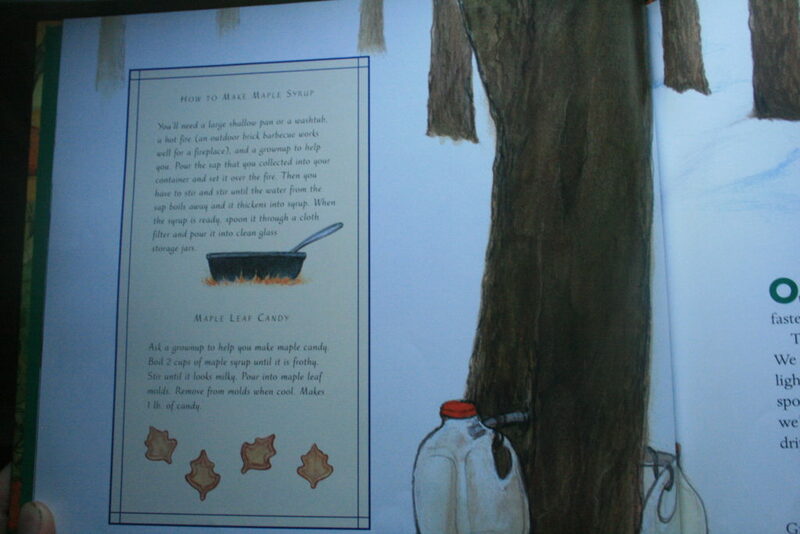 Here, you will find instructions on making maple syrup, zucchini bread recipes and more! Your family will love joining Lily on her gardening adventure! If you have any books you would like to suggest or have me review, please do comment here or send me a message! Having raised 3 girls now that are all readers, I feel your pain. I remember thinking the same thing when we would go to the library. here is a new title to us that I bought this year…The Shortest Day by Wendy Pfeffer also Winter Bees by Joyce Sudman, but illustrations by Betsy Bowen. They may need to wait until November to be read, they are winter stories. ?